Why I think threat intelligence is a critical part of effective cybersecurity? Tells us why threat intelligence is critical to effective cybersecurity and you could receive a coveted Adversary Calendar of your own. CrowdStrike® knows that threat intelligence is a key requirement for comprehensive and effective cybersecurity. That’s why the CrowdStrike Falcon Intelligence™ Team is staffed by the industry’s most experienced and skilled analysts, who every day track the activities of 95 adversaries across the globe. Now, it's your turn to tell CrowdStrike why you think threat intelligence is critical to effective cybersecurity. Send your feedback via the form on this page and you could be rewarded with a calendar that’s not only colorful, it's essential: In addition to the stunning depictions of some of the dangerous cyber adversaries Falcon Intelligence tracks — one image per month — the Adversary Calendar marks crucial dates from around the world that signify when the risk of a cyberattack might be high. These include religious and national holidays, anniversaries of significant geopolitical events and more. Each month, CrowdStrike will review submissions and choose the best ones. The winners will receive calendars and have their answers published on the CrowdStrike Twitter and LinkedIn feeds. 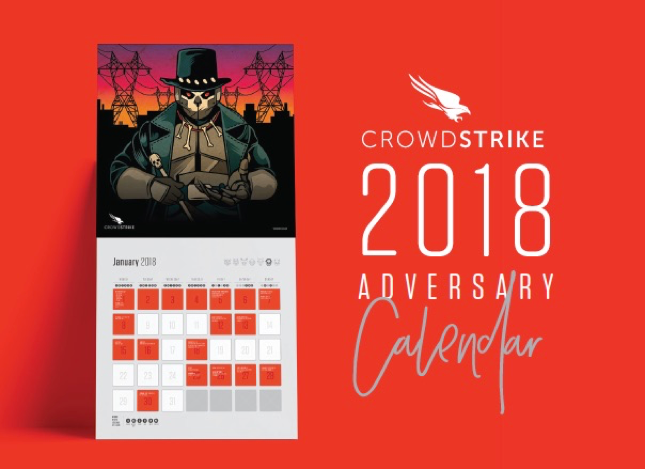 Enter today to win a free CrowdStrike Adversary Calendar!